These Tumbled Stone Coaster Sets make a unique and stylish statement. They are great for a wide variety promotional purposes such as corporate events, banquets, wedding favors, restaurants, hotels and even executive gifts. 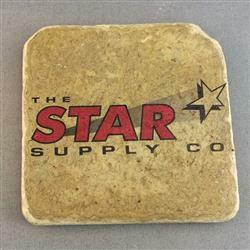 These heavy-weight 4" x 4" natural stone coasters are made of Natural Tumbled Slate (dark surface with many color variations and ridges - suitable for dark imprints.) Felt dots on back of coasters protect furniture. 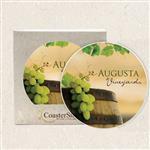 Your customized full-color design is printed directly onto the stone for a durable imprint. 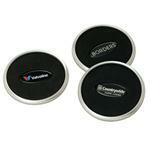 Add your custom logo or picture to make these amazing coasters to do more than just protect your table furniture. Dimensions: 4" x 4" x 0.375"
10oz weight per coaster, Tumbled Slate, Felt dots on back of coasters protect furniture, Customized 4-color process design is printed directly onto the stone for a durable imprint, PLEASE NOTE: Coasters are made of natural stone and so there may be slight variations in color, or imperfections in the surface of the tiles.